That’s not a typo. This cruise excursion costs $33,000 and is, by far, the most expensive tour you’ll find! Here at Gangwaze, we offer 42 shore excursions in Dubai and you could do EVERY one of them for a total of $7,337. Where is this Shore Excursion? It’s located in one of the most boastful cities in the world… Dubai. The United Arab Emirates is a destination familiar with big spending. In the recent years, they’ve invested billions of dollars constructing some of the most impressive / insane projects the world has ever seen. These include an indoor snow-skiing mountain, a man-made island, and a 7-star hotel jutting out of the ocean… just to name a few. 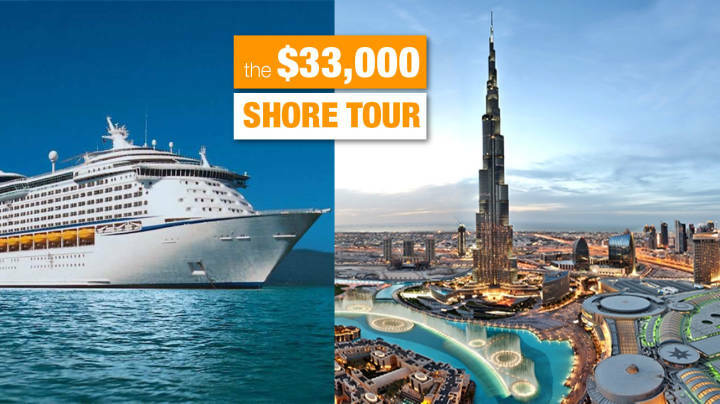 The $33k shore tour has been called the “ultimate shopaholic” cruise excursion. And it includes access to the renowned Rose Arbaji. Wait, you don’t know who that is? Don’t worry, we had to google her too. Apparently, Rose Arbaji is the “most trusted image consultant in the Middle East.” When an Arab Sheik needs to pick out a new suit, he calls Rose. Or when a celebrity is getting a double-chin removed, Rose shows up to decide which one stays and which one goes. For $33k, you can have an attractive woman point out your aesthetic flaws. Sign us up. The tour includes a 3+ hour session in Rose’s famous spa and treatment center located on Jumeirah Beach Road. “JBR” (as it’s known on the catwalk) is similar to a Rodeo Drive in LA or a 5th Ave in NYC. Hopefully 3 hours is enough time to fix all of your problems listed by Rose in step one of the excursion. After your salon treatment, you’ll obviously need to dress the part. Fortunately, your tour includes a personal shopper and visit to the renowned Dubai Mall. The Dubai Mall is the 2nd largest in the world and features a 10-million liter aquarium, virtual reality park, and haunted house. Also, it’s the size of 50 football fields. Not to worry, though, as you’ll have a personal shopper to carry you around. So far, there are few details about the included meal. The only thing we know is that it includes three courses. Does one of those courses include a bite of a rare Arabian leopard? Is Rose Arbaji spoon-feeding it to you? These questions are TBD. Which cruise line offers this tour? You’ll find this most expensive cruise excursion in the world offered by Royal Caribbean. The Jewel of the Seas is scheduled to return to Dubai in 2019 / 2020. The average cost of your cruise to get here starts at roughly $700 (2% of the excursion cost). To put things in perspective, here are a few other items that would cost $33,000. But then again, none of those offer Rose Arbaji. To search all normal-priced cruise excursions, please use the widget at the top of your page. While we don’t have a Rose Arbaji, we do have the largest source of shore tours available in one place!